Several generations of nerds can chart the course of their lives against the career trajectory of "Weird Al" Yankovic. For me, his 1984 album In 3-D was the first record I ever owned, and his appearance at the Wausau County Fair in 1985 was the second concert I ever attended. I spent my 17th birthday being driven to the movie theater — by my mother, of course — to watch UHF, Yankovic's debut as a leading man, by myself. (And I mean by myself; my ticket marked a significant percentage of the film's theatrical grosses.) The night before I turned 20, I jumped into a makeshift mosh pit when Yankovic and his band played "Smells Like Nirvana" at a concert; when I staggered back to my seat, winded, it was the first time I'd ever felt old. Sorry for the self-indulgent reminiscences, but Yankovic has had a profoundly positive impact on my life for nearly 30 years. Not only did he seem like a kindred oddball during that horrible stretch of adolescence when everyone feels like their pants are falling down at all times; he also taught me to look at pop music in a different way — to take it apart, analyze it, laugh at the cliches and put it back together in funny and playful ways. He took my youthful obsession with pop music and fed it like no one else. Last fall, I was honored to write the liner notes to a two-disc greatest-hits package called The Essential "Weird Al" Yankovic, in which I laid out the case for the man's enshrinement in the Rock and Roll Hall of Fame. More than three decades of pop-cultural relevance, during which time many of the stars he parodied came and went. Twelve million albums sold, with the highest-charting one (2006's Straight Outta Lynwood) arriving more than a quarter of a century into his career. A band talented enough to slide seamlessly into dozens of pitch-perfect personae. 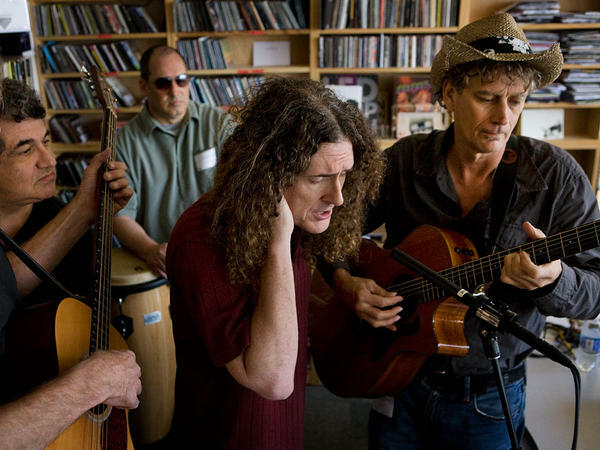 But even after all those accomplishments, Yankovic and his band had one milestone yet to reach: They hadn't yet played their first Tiny Desk Concert. For a band accustomed to perfectionism on stage and in the studio — knowing how to get every note right is, after all, a vital component of any good parody — the modest surroundings and single microphone necessitated some adjustment. But in these three Yankovic originals (1988's "Good Old Days," 1992's "You Don't Love Me Anymore" and the new White Stripes pastiche "CNR"), it's remarkable how quickly the singer and his band adjust and thrive. Now can they get into the Hall of Fame? To watch our most recent Tiny Desk Concert, featuring The Mynabirds, click here.